Manufacturing biodiesel is a simple process but very dangerous if you don’t know what you are doing. The chemicals used, and the vapours released can kill so read this and everything else you can find about biodiesel before you start to play around. Biodiesel can be made in small quantities with just an accurate set of electronic scales, 1.5 or 2 litre drinks bottles, a glass jar with tight fitting lid, a funnel, and you home stove – read our Biodiesel Recipe to find out how. However, if you intend to make usable quantities of biodiesel (10’s of gallons), you are going to need to set up something of a production line and some sort and purchase some specialise items. 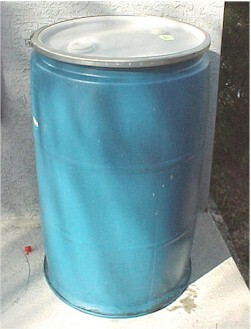 A 55 gallon drum or an old water heater tank is a good starting point. You will need to add an electric heating element of a couple of kW power for heating the vegetable oil, and a mixer blade for stirring the mixture. A pipe needs to be added (welded in place) with a drain valve so that you can empty the drum when you are finished. A brewer’s hydrometer is also useful for measuring that your biodiesel has a specific gravity of 0.86-0.9. Everything else works in pretty much the same way, just scaled up. Mixing the sodium hydroxide with the methanol should be carried out in a sealed HDPE plastic container. If the quantities are such that lifting and shaking it is not possible, then rocking and swirling the mixture around will do the job as long as you are not in a rush. Washing the biodiesel is more difficult and requires a dedicated wash tank.